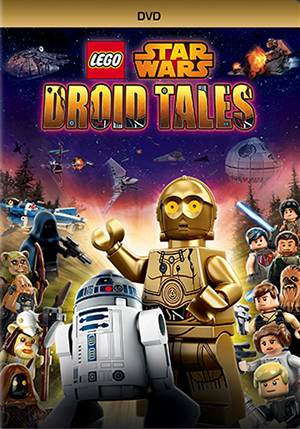 " Nobody would ever believe you to ever be capable of what you’re doing "
Lego Star Wars: Droid Tales is likely to tickle the funny bones of both seasoned Jedi Knights and Padawan learners. Legos used to be just a collection of blocks. It was a big deal when angles and textures were brought into the mix. Then poseable figures were added. And then, somewhere along the way, Legos exploded into extravagant (and sometimes pricey) playsets. From there, the Lego infrastructure grew, block by block and format by format. Amusement parks, video games, movies and TV productions have expanded the reach into a global empire. Lego’s video games are a hoot. Plucking popular franchises such as Star Wars, Indiana Jones, Batman and Harry Potter, they mix the familiarity of those blockbuster brands with the playfulness of childhood. The games exhibit a bounty of imagination and exuberance. They’re funny and engagingly challenging at the same time. Sharing in that same spirit, 2014’s The Lego Movie (directed by Phil Lord and Christopher Miller, who are currently developing a live-action Han Solo movie) was a franchise- and genre-bending smorgasbord of animated fun. Many of those sensibilities carry over to this Lego DVD release, Star Wars: Droid Tales. Droid Tales features five episodes; the action starts with post-party cleanup duty on Endor after the destruction of the second Death Star. Plenty of visual gags accompany the dialogue. This sets the stage for a recounting of the previous adventures, essentially Episodes I-VI, as seen through the eyes of C-3PO and R2-D2. Nothing is off limits in this limited series. Fun is had with the opening text scroll, snore-inducing plot points like The Phantom Menace’s chatter about trade route taxes and Jar-Jar Binks. Yeah, the bane of most fans’ saga enjoyment gets ribbed in a cross-episode sight gag that is mighty funny. The jokes also poke fun at the series’ movie titles (Attack of the Clones, in particular), plot holes and the questionable decisions made by key characters. The humor is far from traditional, simple children’s programming. Here, it feels a lot like that of a fan film, and the humor conjures up memories of shorts like Hardware Wars and Porklips Now — affectionate sendups made by fans working on a shoestring budget. And, much like The Lego Movie, the goofy action plays like the unspooling imagination of a 9-year-old playing with Star Wars action figures. Hence, General Veers (The Empire Strikes Back) returns out of nowhere as a lead character. Adding to the feel-good vibe of this friendly parody is the voice talent, which features the return of Billy Dee Williams as Lando Calrissian and Anthony Daniels, who has made an entire career around his vocal talents behind C-3PO. And Tom Kane, familiar to fans of other Star Wars animated and video game properties, returns as the series’ narrator. This series was originally produced for Disney XD last summer and, while it doesn’t quite boast the same big-budget, high-level production values of The Lego Movie, it is still a quality effort designed for the smaller screen. Given the original release schedule of this series, a joke about the lack of female characters in the Star Wars universe can, at least now, serve as a wink at The Force Awakens and the impressive star turn taken by Daisy Ridley and the introduction of Rey. This is a bare bones release, only packing a couple promotional peeks at other Disney properties, including Star Wars: Rebels. The packaging includes a set of three Lego Star Wars character trading cards. There’s something about the seated group of Lego stormtroopers on one of the cards that is simply funny to look at. However, there are three sets of three cards exclusive to the DVD, so how exactly all three sets are supposed to be “collected” is a question for higher pay grades. Maybe there’ll be a lot of wheeling and dealing of trading cards on the playground. As already mentioned, the production isn’t intended to present the immaculate visual detailing and sound design of a big-budget production, so this DVD release serves the material quite well. On the technical front, the series is presented in 1.78:1 and the disc offers audio options for 5.1 Dolby Digital in English or Spanish as well as 2.0 Dolby Digital in French. Subtitles are available in English (SDH), Spanish and French.